The Debutante Princess Cut Micro Pave Set Round Split Shank Cubic Zirconia Solitaire has arrived. 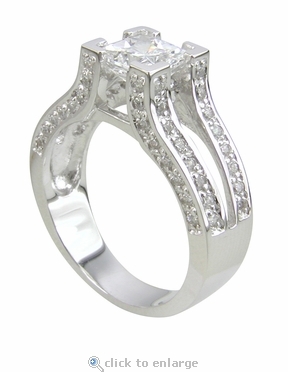 This high quality hand cut and hand polished cubic zirconia ring will certainly make a statement. The Debutante Solitaire features a 1 carat 6x6mm princess cut cubic zirconia center stone and over 60 micro pave set round cubic zirconia stones that are placed half way down the vertical and horizontal walls of the split shank. 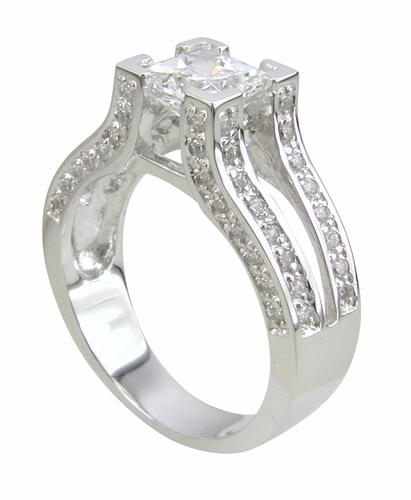 The split shank flows up into integrated prongs that secure the 1 carat princess cut cubic zirconia center stone. 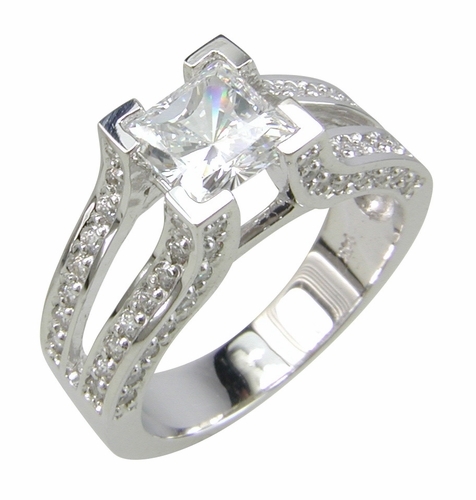 The Russian formula hand cut and hand polished princess cut cubic zirconia features 104 sparkling facets and the ring includes a total carat weight of approximately 2 carats. The band measures approximately 7.5 mm at its widest point. This item is a clearance item and a final sale item. Clearance items are stocked in a certain finger sizes. They may be sized for an additional fee, please see menu option. Sizes below a 5 or above an 8 can be made via special order. Please call 1-866-ZIAMOND for a quote.